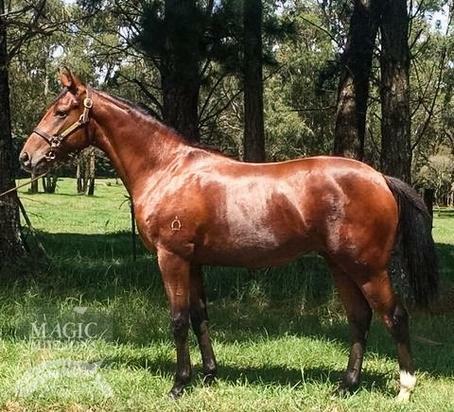 EPAULETTE (AUS) (Bay 2009-Stud Ire. 2014, Aust. 2014). 5 wins-2 at 2, ATC Golden Rose S., Gr.1. Half-brother to SW Helmet. Sire of 216 rnrs, 93 wnrs, inc. , SP McMunigal, Field of Roses, Lapulced'acqua, Omaha Beach, Sankari Royale and of Dianthus, Faulette, Wind Test, Dance on the Day, Epaulement, etc. His oldest Aust.-bred progeny are 3YOs and inc SW Soqrat (Greyville Premiers Champion S., Gr.1), Meryl, Khulaasa, Cossetot, Military Zone, Rock Dove, SP River Bird and of Epaumada, etc. TEOFLIGHT, by Teofilo. Unraced. This is her first foal. Highlight. 5 wins from 1400m to 1900m, NZ$33,025, A$82,445, ATC XXXX Gold H., Xlerator Dryer H., Whangarei RC Aussie Butcher F&M Series Final, 2d ATC Ranvet H., Warwick Farm H., MRC (Mornington) Download Sportingbet App H., 3d ATC Congratulations Chris Waller H., Happy 40th Birthday Kate Nivison H.
Fluoro Lite. 4 wins at 1200m, 1400m, ARC Schweppes H., Southern Hospitality H., 3d Counties RC Vernon & Vazey Truck Parts Ltd H., BOP RC Genera Genus H.
Brother Lehamn - Elephant Magic (H.K.). Winner at 1400m in NZ, 3d HKJC HKU Space H., Being Famous H.
De Jorvik. 6 wins to 1350m to 2018-19, SAJC Hughes Limousines H., 2d SAJC Junction H.
Airacobra. 3 wins at 1000m, 1200m to 2018-19, 2d Ipswich TC Sky Racing H.
Too Much Torque. 6 wins to 1200m, NZ$92,560, A$2,000, Amberley RC Combined Wool Industry H., Hororata RC Selwyn Rakaia Vet Services H., CJC Farrier & Equine Supplies H., Coupland's Bakeries H., 2d CJC Speight's H., Brabazon H., Otago RC Peter Lyon Shearing H., 4th CJC Great Easter S., L, Timaru S., L.
Firejet. 3 wins from 1400m to 1900m, Traralgon Cup. Wolverhampton - Both Sure (H.K.). 2 wins at 1200m in NZ and HK, HKJC Phoenix H., 2d HKJC Violet Hill H., 3d HKJC Tin Lok H.
Giant's Loom. 3 wins from 1000m to 1600m in Philippines. Chica Rapida. 2 wins at 1400m, 1600m to 2017-18 in NZ. SUPERJET (Jetball). 2 wins. See above. CUP OF GRACE (Royal Chalice). 8 wins from 1400m to 2000m, R972,710, Bloemfontein Thaba'nchu Sun Casino S., Gr.3, Thaba'nchu Sun Casino S., L, 2d Vaal Home Guard H., L, Clairwood Easter H., L, Turffontein Summer Cup Consolation H., Winner's World Form Factor H., Newmarket GMC Airconditioning H., 3d Turffontein Summer Cup, Gr.1, Newmarket Elevation S., Gr.2, Turffontein Drum Star H., L, Newmarket Java H., L, Scottsville Michael Roberts H., L, Turffontein Computaform Rating H., 4th Newmarket Victory Moon H., Gr.3, Turffontein Jubilee H., Gr.3. Decorum (Dominion Royale). Winner at 2, 2d Fairview East Cape Fillies Nursery, L.
PRINCESS VICTORIA (Victory Moon). Champion 2YO & 3YO Filly in South Africa in 2010-11 & 2011-12. 10 wins-4 at 2-from 1000m to 1600m, R2,174,045, Scottsville Allan Robertson Championship, Gr.1, Kenilworth Cape Fillies Guineas, Gr.1, Greyville Golden Slipper, Gr.1, Garden Province S., Gr.1, Clairwood Tibouchina S., Gr.2, Kenilworth Choice Carriers Championship, Gr.2, Clairwood Poinsettia S., Gr.3, Kenilworth Champagne S., Gr.3, Summer Juvenile S., L, 3d Kenilworth Cape Guineas, Gr.1, Scottsville South African Fillies Sprint, Gr.1, 4th Greyville Garden Province S., Gr.1. Producer. PRINCESS ROYAL (Captain Al). 4 wins-2 at 2-at 1100m, 1200m, R621,875, Kenilworth Sceptre S., Gr.2, Fairview East Cape Fillies Nursery, L, 2d Scottsville Allan Robertson Championship, Gr.1, 3d Scottsville Strelitzia S., Gr.3, 4th Kenilworth Southern Cross S., Gr.2, Summer Juvenile S., L.